I've been waiting and wanting to read this book. My awesome library ordered it for me. I heart libraries. This will be a book I will add to my own personal library though. Probably when the next book comes out. My daughter and I both loved this book. Fia and Annie are sisters with some awesome abilities. Both are strong and very protective. They are both being manipulated by the bad guys. It's heart wrenching. The characters in this book are well defined. I felt like was right there with them, watching it all. When a book makes a movie in my head, I know it's a good book. Agree? 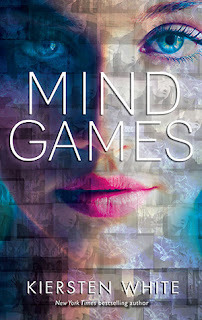 You can buy Mind Games on Amazon. Super intrigued by this review! Dark and twisted? Heart wrenching? well defined characters? Sounds like my kind of book! I'm so intrigued by this book, everyone is loving it! I very badly want to read it, I'm glad that both you and your daughter enjoyed it, it's great when you can share books with family! I hope I can read this one soon!! I liked this book but was left with so many questions-White better answer some of them in the sequel!